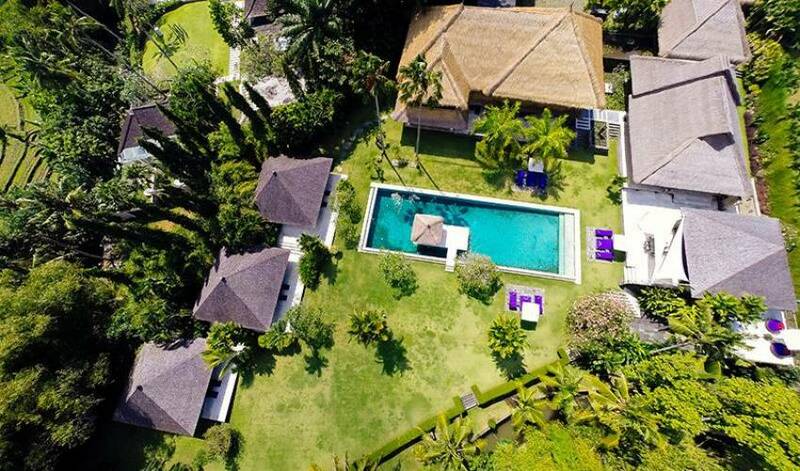 Fully staffed and with six large bedrooms and converted study (which can serve as an additional bedroom), a deluxe 30-metre swimming pool and lavish living areas featuring a unique mix of modern art and exotic artefacts, this exquisite villa exudes space and charm. 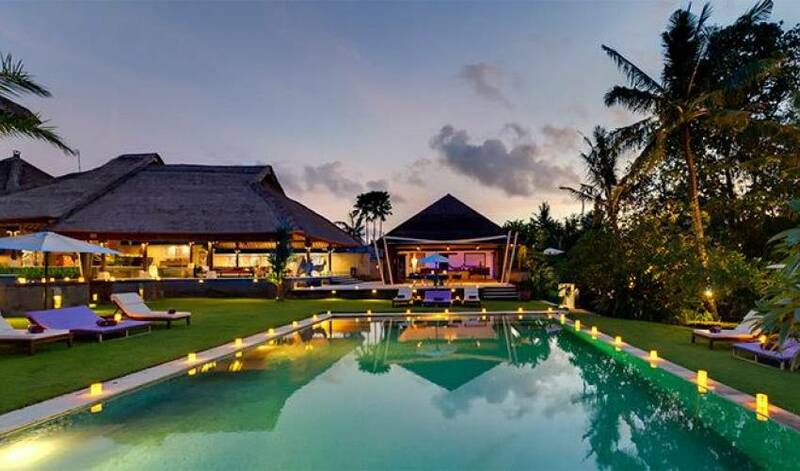 Located in the rural district of Canggu, just minutes from some of Bali’s most revered surf beaches, the villa offers incredible sunsets with glimpses of the mystical Batukaru volcano in the distance. 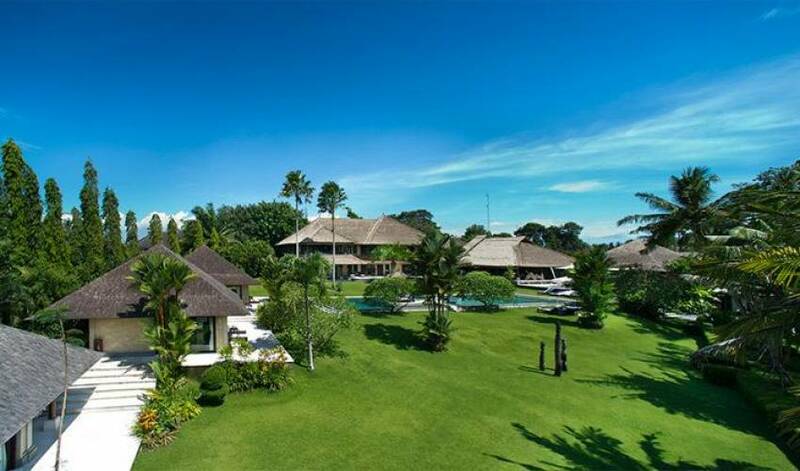 The villa is a magnificent property overlooking the picturesque rice fields of Canggu and situated just minutes from the famed surf breaks at Echo Beach on Bali’s south-west coast. Resting upon 5,300 square metres of beautifully landscaped gardens and lawns bordering the Pangi river, with a divine 30-metre swimming pool as its centrepiece, the villa invites guests to enter a world of total peace and privacy. 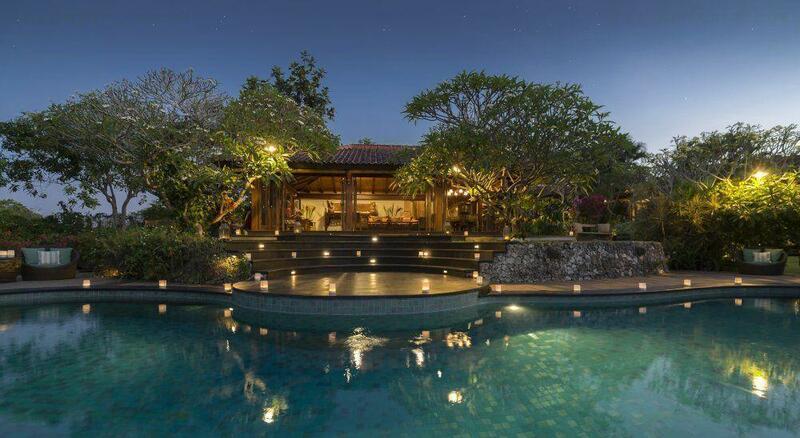 This luxurious home delightfully pairs the old with the new – classic Balinese architecture with alang-alang thatched roofs, sandstone walls, polished stone and dark wood floors provide the perfect backdrop to showcase the owner’s striking modern artwork. Funky sculptures mingle with handpicked Indonesian artefacts to create an interesting dimension of shapes and textures that represent the blending of different cultures. Featuring six bedrooms and a converted study (which can serve as an additional bedroom), generous living and dining areas and a separate lounge bar with two adjoining terraces, there’s plenty of space to relax and unwind. The pool’s floating gazebo provides a soothing location for a massage or to practice meditation and embrace the villa’s uplifting energy. With butler service and a private chef on hand to prepare delicious Asian and Western dishes you need not lift a finger; just lie back and indulge in the luxurious surroundings and magical sunsets. 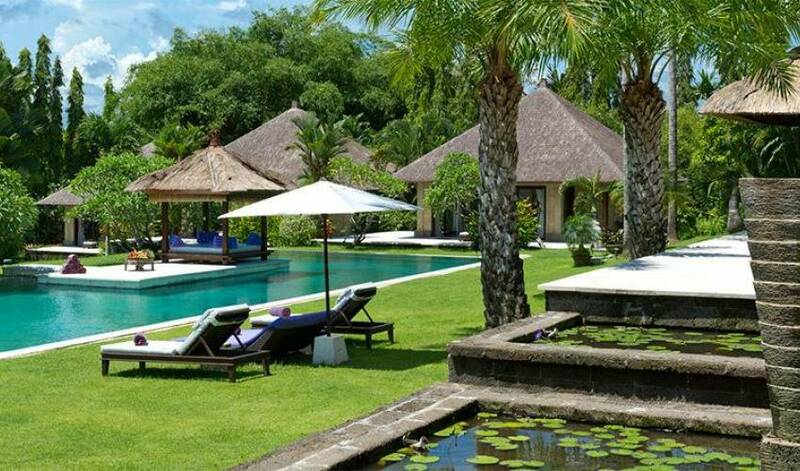 The villa’s perfectly manicured lawns, exotic tropical flora and stunning outlook make the villa an idyllic setting for weddings, parties and special events. From a traditional wedding ceremony to a unique and memorable birthday celebration, all dreams can be capably realised. Suitable for all interests and ages – from extended families to groups of friends – this villa is also the ultimate destination to rejuvenate mind, body and soul. Embark on a spiritual retreat in this peaceful haven surrounded by natural beauty and the stresses and strains of modern life will soon evaporate into the tropical air. The entrance to the villa immediately sets the mood with beautiful fish ponds featuring purple water lilies, a cascading waterfall and large stone vase fountains creating a peaceful tropical ambiance. 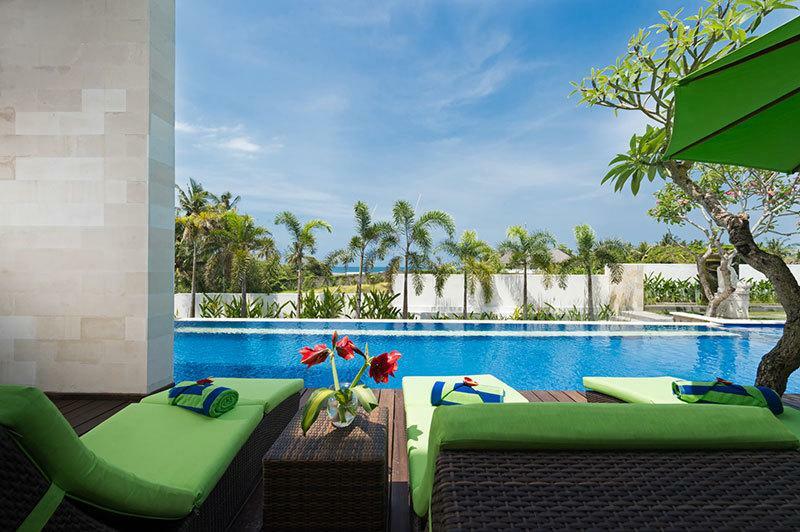 The villa’s 30-metre swimming pool is the focal point of the design with all rooms strategically positioned around it to optimise the views of the stunning landscaped grounds. Two generous master suites face the pool from the upper storey of the main bedroom pavilion just above a guest room and converted study/children’s bedroom, while three further guest suites occupy their own pavilions, privately spaced apart among the gardens and overlooking the rice fields. 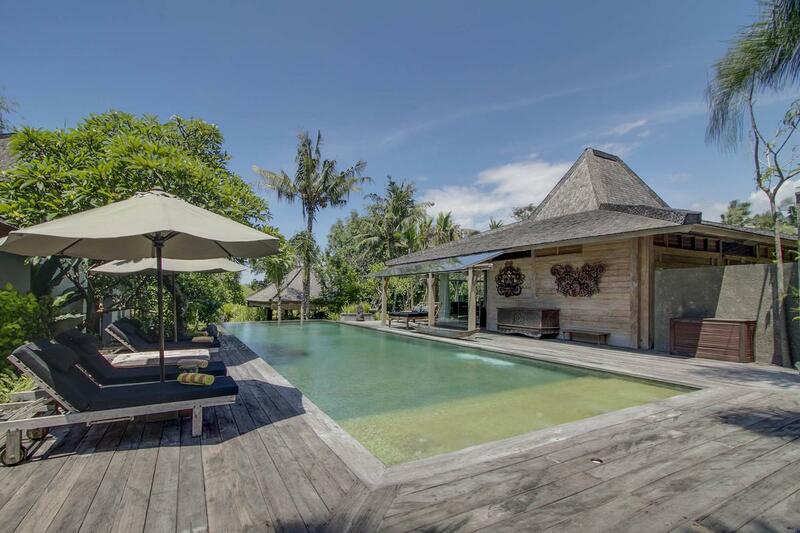 The villa’s tastefully decorated, tropical Bali-Style living spaces step down in a series of thatch-roofed pavilions towards the rice fields and the river. Chalina’s 250-square-metre open-sided living and dining area is a highlight of the estate. Cooled with ceiling fans this spectacular two-tiered pavilion with its enormous alang-alang thatched roof provides the ultimate leisure and dining experience. Guests can relax on the extremely comfortable L-shaped sofas and ottomans set around a coffee table. Vibrant purple and red upholstery, modern sculptures and bright artwork bring this traditional structure to life. On the upper tier, the dining area is fit for a banquet with its huge wooden table and funky purple wicker chairs. Next to the dining pavilion are ponds filled with water lilies, a cascading waterfall and tall vase fountains which flow gently in the background. To the rear of the dining area is a fully equipped stainless steel kitchen complete with two ovens and gas burners, microwave, double-door fridge, freezer and coffee machine. Alongside the river, just in front of the living and dining area, is an air-conditioned lounge bar which adapts to become a comfortable cinema room in the evening. There’s plenty of space on the two large daybeds for guests to unwind while beverages are served from a black granite counter. If preferred, the French doors can be opened onto two terraces to make the most of the tropical air; one overlooking the Pangi river and the other facing the pool, shaded with sails and featuring an eight-seater dining table. The lounge bar boasts a Bose sound system which also feeds music to the garden areas, while a powder room positioned just below is particularly convenient for guests attending weddings and other special events. 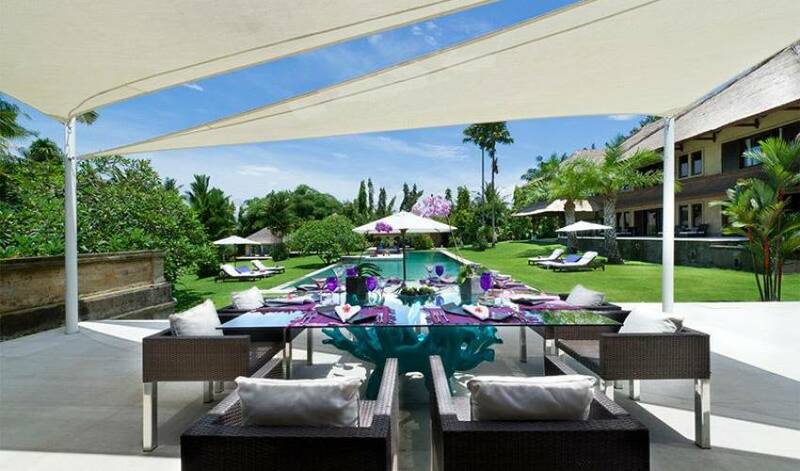 The centrepiece of the villa, the 30 x 8-metre swimming pool sits strategically overlooking the sloping garden and neighbouring rice fields making it the perfect spot for sundowners. Single and double loungers shaded by umbrellas provide poolside comfort, and floating above the water, a comfortable thatched bale makes a magical spot for a massage. Surrounded by coconut palms and dotted with fragrant frangipanis, the impeccably manicured lawns provide a wonderful setting for yoga and meditation as well as weddings and other special events. The villa’s main two-storey residence houses three bedrooms and the study, which can be converted to an extra bedroom, while three further bedrooms are situated in individual pavilions leading down towards the river. Each of the ensuite bedroom is air-conditioned and features black-out curtains, a flat-screen TV and DVD player and a small fridge. 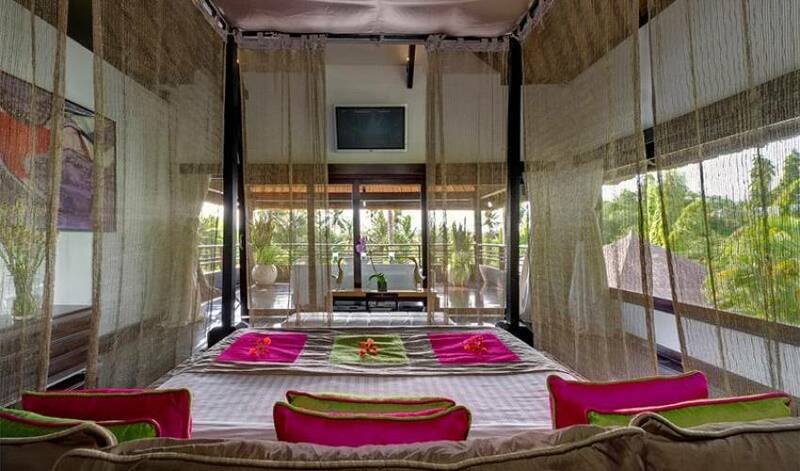 This huge suite has incredible views over the garden and rice fields. A king-size four-poster bed with golden mosquito net and bright fuchsia and green cushions sits proudly in the middle of this high-ceilinged room between side tables supporting feathered lamp shades, while behind the bed, two white sofas contrast nicely against the dark-wood floors and artwork. Glass sliding doors open onto a covered timber deck complete with a comfy sofa and ottomans. The ensuite bathroom offers a large stainless steel bath, wooden vanity with twin basins and a walk-in terrazzo rain shower. Guests in this room enjoy exclusive access to satellite TV. Opposite Saffron on the first floor landing, the second master suite, Amber, also presents stunning views across the pool and garden. The netted, four-poster king-size bed sports bright turquoise cushions and white feather lampshades ornament the bedside tables. Furnished with an eclectic array of artefacts and artworks, this room also features a mezzanine level complete with TV and queen-size daybed (which can be used as an extra bed). A walk-in dressing room and ensuite bathroom with Palimanan stone floor, rain shower, stainless steel bathtub, and twin basins complete this suite. Downstairs, the queen-bedded Ginger room opens out onto a large stone patio area that looks directly over the inviting swimming pool. This room can be accessed from the garden and from a walkway at the rear of the building featuring enormous vase fountains cascading into a fish pond. Splashes of bright orange and purple silk and a white egg-shaped chair inject vitality into the room, contrasting with its polished grey terrazzo floors. Off the bedroom lies a separate dressing area and an ensuite bathroom with Palimanan stone floor, rain shower, stainless steel bathtub, and twin basins. Also located on the ground floor of the main building, the converted study – which is ideal for children – features twin whitewashed teak beds draped with mosquito nets and polished grey terrazzo floors. Like the Ginger room, Cinnamon opens onto the large stone patio facing the pool and can also be accessed from the rear walkway. Funky Japanese doll lampshades light up the room while a white egg-shaped chair sits in one corner. The bathroom is identical to that of the Ginger room. Three guest bedrooms face the pool in stand-alone pavilions set on lawns sloping down towards the river, each with a patio from which to enjoy the view. The three rooms are similar in design but feature differently hued bathrooms and individual artwork. Each room is furnished with a queen-size four-poster bed draped with a mosquito net. Ensuite bathrooms feature cobbled stone floors, black marble twin wash basins and rain showers. Surrounded by terraced rice fields and only five minutes’ walk from the nearest beach, Chalina Estate is located in the traditional village of Pererenan in the district of Canggu on Bali’s south-west coast. 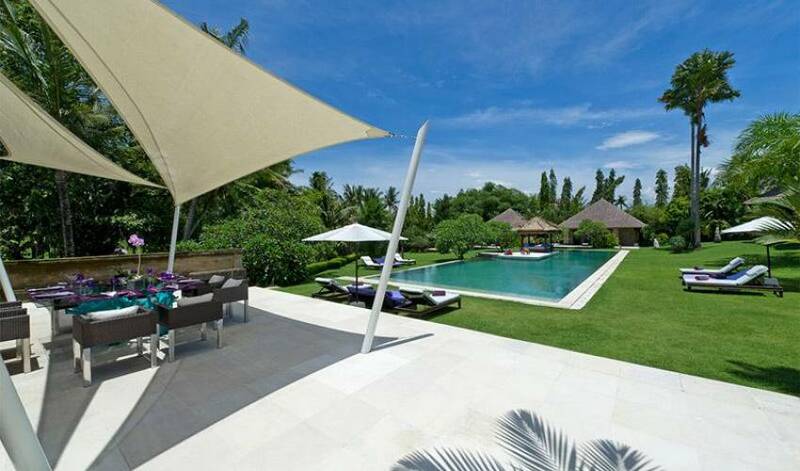 Despite its rural setting, the villa is only 25 minutes’ drive from the many restaurants and shops of cosmopolitan Seminyak. World famous Echo Beach is also within easy reach (10 minutes by car), where guests can enjoy the laid-back surfer vibe and incredible sunsets. The mountains and rice terraces of Tabanan are a photographer’s dream, and the wave-lashed sea temple at Tanah Lot and neighbouring Nirwana Bali Golf Course are just a fifteen minute drive away. We had an excellent stay at Villa 3220. The Villa itself was exceptional and all the staff were extremely helpful and dedicated to ensuring all aspects of our stay were fantastic.